The famous Die Schützenliesl painting, Friedrich A. von Kaulbach (1850-1920). Stoneware brewery stein, ½-liter, from the Brauerei Münchner Kindl. Metal advertising sign for Blatz Old Heidelberg Beer from Milwaukee, Wis.
Front and rear views of V&B #2235, 1-liter, etched. The illustration was obviously based on Kaulbach's painting. Note the fence-mounted target. Target discs adorn both side panels, and the lid inlay displays a winner's Pokal. 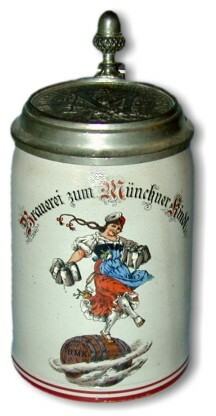 Schierholz character stein (ECS 447), Schützenfest theme, including the image of Schützenliesl, portrayed on a barrel. First published in the June 1990 edition of Prosit. Revelers in Munich's famous beer cellars often sing the song of Schützenliesl. Most are not aware that she was a real person and not the product of someone's fertile imagination. More than 100 years have passed since she was the number one topic of conversation in the Bavarian capital. People spoke and heard much of this beautiful 21-year-old, a beer waitress in the Sterneckerbräu brewery restaurant. Though more than a century has passed and life has quickened to a frenzy, we can still go back and enjoy Schützenliesl's likeness on our beer steins, be they of glass, stoneware or porcelain. 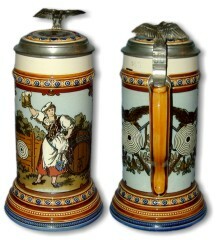 Her picture adorns the front of many steins, can be found hand-painted on porcelain inlaid lids or cast in pewter relief, and, in a few cases, in a three-dimensional form as a thumblift. 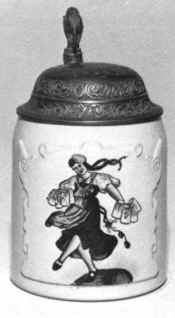 Munich's Brauerei zum Münchner Kindl used her pleasant image for the decoration of their brewery steins after 1880 (the brewery itself was merged with the Unionsbrauerei in 1905 which in turn was bought out by the Löwenbrauerei in 1921). Schützenliesl's fame extended even to America, where at least one brewery, Blatz of Milwaukee, used the image from Kaulbach's painting on its advertising. 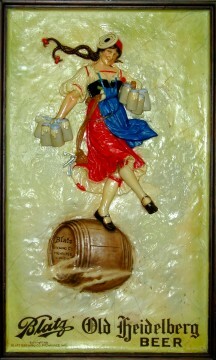 Illustrated is a 3x2 foot cast metal embossed and polychrome rectangular sign with "Blatz Old Heidelberg Beer" near the bottom and "Blatz Brewing Co. Milwaukee, Wis., Copyright 1933," on the keg from which Schützenliesl appears to jump with her many full beer steins. 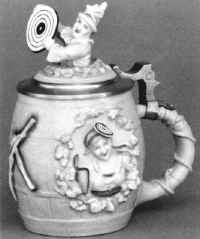 Nearly every stein manufacturer in the golden age of stein making from 1880-1910 produced his own version of Schützenliesl steins in any and all techniques, from plain gray-blue saltglaze relief stoneware to hand-painted, decal decorated or etched variations such as Villeroy & Boch's 2235 or 2029. She was also made as a figural character stein, ECS 448. In America she's often called the "Target Girl" because of the flat, disc-like target-shaped hat that sits rakishly on her flying braids. The famous beauty was born in 1860 in a small village near Aichach, northwest of Munich in Bavaria. She was an illegitimate child and the parish priest therefore assumed the right to choose a given name for the little girl, a privilege much abused then by the clergy who were sometimes known to saddle these innocents with the most unusual, ill-suited or embarrassing names, which told anyone right away the circumstances of the child's birth. The baby received the non-Bavarian name Coletta (presumably after a St. Coletta); it sounded foreign to Bavarian ears. Her mother soon tired of the malicious talk and moved to the big city, sending for the child at the first opportunity. Little Coletta, upon reaching school age, went to the convent school of the Poor Sisters in Munich. After graduation the young lady went to work as a beer maid and became a waitress at the Sterneckerbräu brewery. There the cheerful and very attractive girl caught the eye of a famous painter, Friedrich August Kaulbach, who specialized in immortalizing beautiful women on canvas. Sometime in 1881 he posed Coletta in her native folk dress, put a target-shaped hat on her head, placed a number of foaming beer steins in either hand and painted her, ready to jump off a rolling barrel. Model and painting from then on were known as Schützenliesl, a name Coletta gladly exchanged for her old one. Kaulbach presented his work to the Executive Committee of the 7th German Federal Sharpshooting Festival (Bundesschiessen) which was held in the summer of 1881. The canvas was exhibited in a beer tent at the Theresienwiese, site of the Oktoberfest. A pilgrimage of Münchners began at once, all of them eager to see for themselves the painting and the model, to compare the two and to have a few brews in the tent of the Schützenliesl. Rumor had it that the tent proprietor dispensed some 16,000 Mass beer (1 Mass = 1.05 quarts) in just one day, a considerable amount even for those times. In the autumn of 1881 the Oktoberfest again presented the "One and only original, genuine Schützenliesl" (spelling may vary to Schützen-Liesl or Lisl, the latter being the Bavarian version of Lisa), as "Schützen Coletta" simply would not do. And again the young lady was the grand attraction whom young and old had come to see. Day after day the tent Zum Schützenliesl was filled to capacity as huge crowds were drawn to the Theresienwiese. Many women pondered the mystique of Schützenliesl's special attraction. Newspapers reassured that "Schützenliesl is a current novelty and there is no danger that the men will lose their heads over her." At Oktoberfest's end great concern was voiced over the future and safekeeping of the illustrious painting. Munich breathed a sigh of relief when the City Council put it on permanent exhibit at an inn. It had been donated to the City by the Board of the Federal Sharpshooting Competition, as a "sale to a private person was out of the question," to quote one newspaper. Today the painting hangs in the Schiesstätte building on Zielstatt-Strasse. The Schützenfest was a popular social event in the late 19th and early 20th century. This famous affair was held on weekends in open fields throughout Germany. The matches were conducted in a formal manner with competition being extremely keen. The weapons were odd-looking "free rifles" which are still being manufactured today by specialized gunsmiths abroad. The range varied from 50-300 meters; the rifles were fired from the off-hand position and only the marksman's hands and arms could provide support for the rifle. 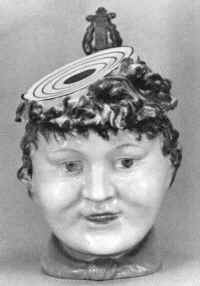 Targets were wooden discs with concentric circles painted on the face. These Ehrenscheiben (honor targets or plaques) can also be elaborately painted with folklorical designs where well-known artists supplied the art work, such as Franz Ringer, who designed his share of them from around 1900 to his untimely death in 1917. Circulating throughout the crowd were the Schützenliesls, serving the local brew. It was easy to spot them by the target-shaped caps they wore on their heads. The prize most often awarded at competition's end was the target itself or one of several suitably decorated beer steins or drinking horns, sometimes engraved with the winner's name and contest date. It cannot be now determined whether the beer waitresses at Schützenfests circulating among the crowd with their full and empty steins were referred to as Schützenliesls before Friedrich August Kaulbach painted Coletta and name the painting thus, or if the term originated after 1881. Schützenliesl Coletta, after that eventful year 1881, had a long and varied life yet ahead of her. She married twice and was the mother of 12 children. She worked in an even dozen of Munich's well-known brewery restaurants and cellars. Even in her old age she loved to visit with the shooters on the Theresienwiese, to talk of old times. Shortly before Christmas 1953 the newspapers reported her death: She was 93 years young. At her funeral in the Waldfriedhof (Forest Cemetery), the State Shootmaster eulogized her thus: "We alone are still fortunate to possess you in all your former loveliness. You are immortal and will not be forgotten. You are a part of Munich's history, as well known and almost as well loved as the Munich Child." And loved too, by beer stein collectors.